Make quick, colorful, layered creations! Add art sand to flip-top shakers. Or empty into cups for easy distribution. Fine terrarium sand in 2-lb. bags. 12 bags in 12 kid-favorite colors! 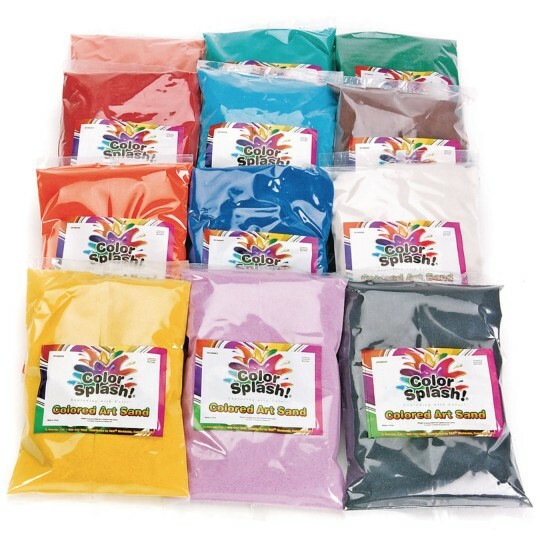 Use for sand art and other craft projects. Twelve 2-pound bags in 12 assorted colors. Colors include Black, Brown, Blue, Coral, Emerald Green, Green, Lavender, Light Blue, Orange, Red, White and Yellow. 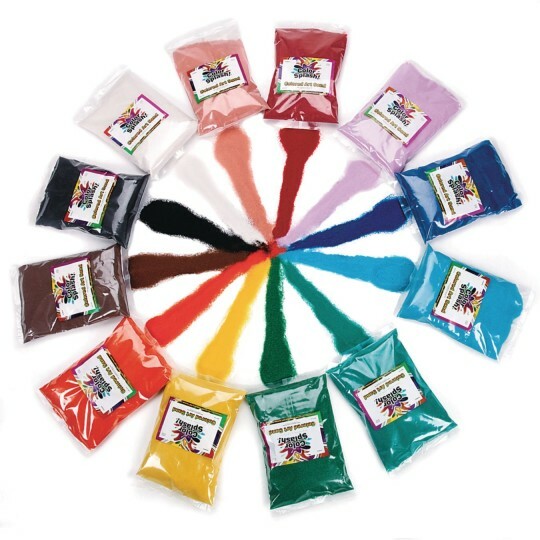 WE used this product for the first time this year at our summer camp and the kids and art director loved the quality and variety of colors. Many projects were made using this sand!! Perfect for our memory vessels! We have small vases that we pour individual colors of sand into. As a name of a loved one is called the family/friend is asked to come up and pour the beautiful colored sand into a large vessel. This sand makes a wonderful display of artwork. I used this with the sand sticker art projects just with glue and sand art bottles. Kids loved it. 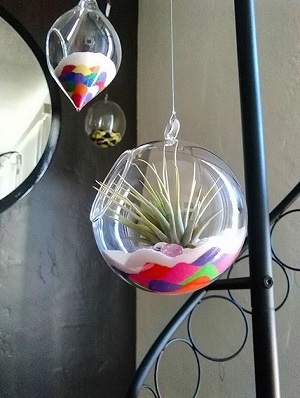 Colorful Indoor Sand Terrariums using Air Plants and Succulents, or even Fairy Gardens have become increasingly popular lately – and its no surprise because they are bright, beautiful and adorable! Here is a step by step tutorial on how to make your own sand garden with our S&S Color Splash colored sand! Step 1: Decide which colors you’d like to use. For this specific design, I chose bright colors that pop! Step 2: Using one of the colors, begin to lay the foundation at the bottom of your terrarium bowl. Take a paint brush and begin to sharpen out the lines. Step 3: Add the next layer or colored sand. Continue to alternate between colors for each layer. TIP: Use a small spoon to add each layer! Step 4: To brace your design, add a layer of sand to the center. TIP: Placing a mirror under your terrarium bowl/globe is a great way to view your design as you work! Step 5: Finish the design by adding a single layer of sand to coat the top. Then place a plant in the globe. Voila, your very own indoor sand garden! Tip: Clean the inside of the globe/bowl with a paint brush once finished.